The design of the MGX-21, like all Moto Guzzis, begins by showing of the engineering of the big 90° transverse V-twin engine with two large cylinders that seem to literally explode out of the petrol tank, helping to make the side view considerably lower and streamlined. The red paint of the aluminium head covers emphasise the power this engine is capable of expressing. Low in the back and raised at the front, MGX-21 tells you from the first glance that it is capable of eating up miles smoothly. It’s certainly no wallflower, attracting people’s attention with its original shape and the mysterious nocturnal appearance created by the PADC (Piaggio Advanced Design Center) designers in California. 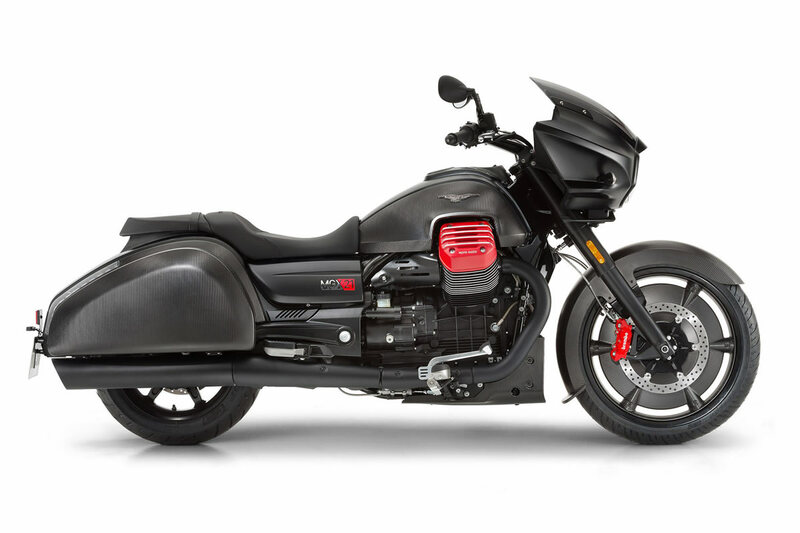 Particular attention was given to the study and definition of the “batwing” design, the large top fairing that makes an essential contribution to the bike’s futuristic look. Form and function once again come together in perfect balance: the careful fluid dynamics analysis with CFD (Computational Fluid Dynamics) simulations and the numerous test sessions in the wind tunnel have led to achieving optimum air protection capacity, delivering a quality a bike destined for long trips. The shapes at the back also stem from the same studies and they are enhanced by carbon profiles and the dual series built-in LED lights. 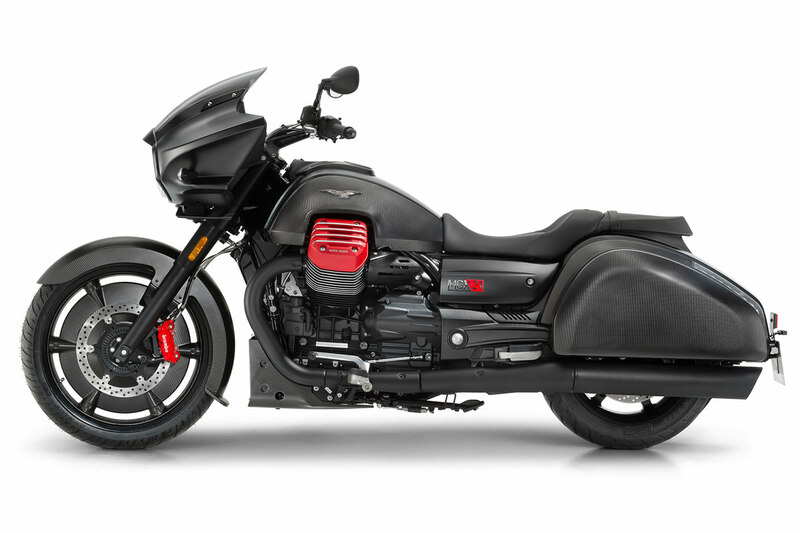 To celebrate such a personal, powerful and brave style, Moto Guzzi gave the MGX-21 the evocative soubriquet of Flying Fortress. 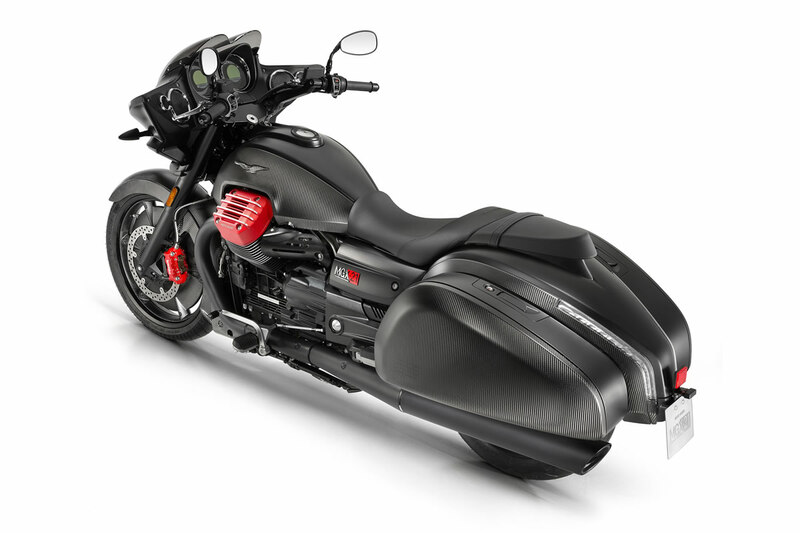 The Flying Fortress also stands out for meticulous and obsessive attention to detail: the spectacular headlight cluster uses LED DRL lighting technology, whereas the electrical controls on the handlebar are finished with metal shells. While respecting the solid century-old tradition, the MGX-21 reaches out to the future by employing materials typically used in the most advanced sports motorcycles. In fact, numerous parts are made of precious carbon, such as the front mudguard, the fuel tank panels, the side pannier covers and the engine cover. 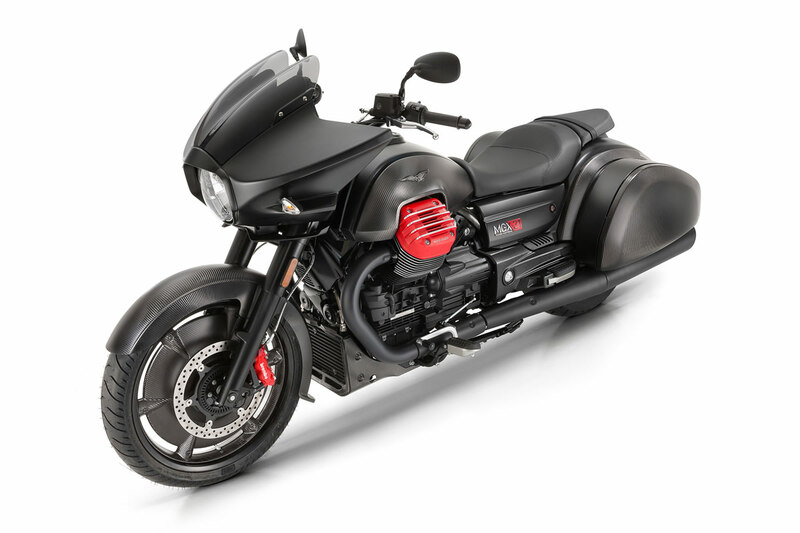 The new Moto Guzzi shows off a large 21″ alloy front wheel, now protected by lenticular carbon covers with small openings where the spokes intersect with the channel. This stylistic choice also brings the technical advantage of increased stability and ease of handling due to the passage of air from one side of the hub to the other while the bike is in motion. 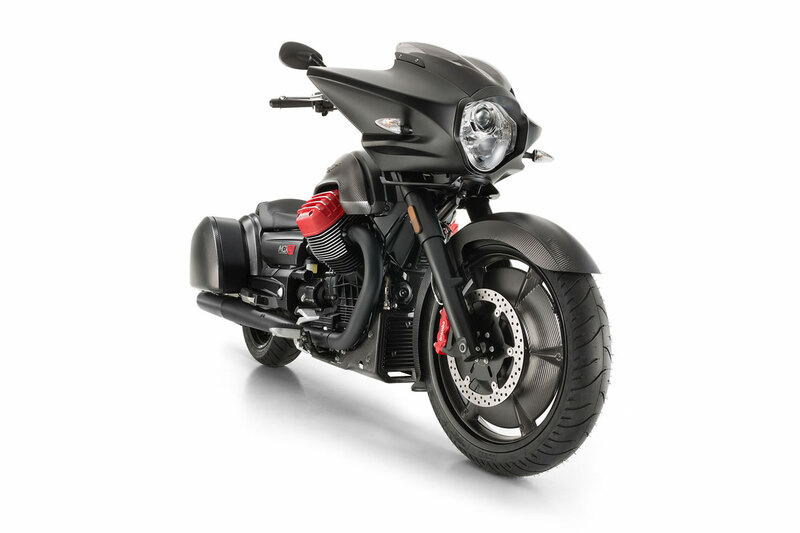 All this verve is controlled by a benchmark braking system worthy of a sports motorcycle, comprising of a trio of large diameter discs and four-piston front callipers and radial connection that is painted red to highlight the MGX-21’s exhibitionist personality. The suspension system also boasts quality elements: the powerful fork with 45 mm diameter stanchions works with a pair of rear shock absorbers that have an adjustable hydraulics extension and spring preload through the convenient remote hydraulic preload. Front Wheel 3.50" x 21"
Got a question about this Moto Guzzi MGX-21?